Sewa News 3/26/2013--Nancy Kanu and Fatu Koroma were the quintessential homemakers, poor, barely able to read or write, eking out a living in rural Sierra Leone. But the women—for whom accessing jobs or economic and technical opportunities was only a pipe dream—now have new skills plus an added source of income as they lead a growing number of women using techniques that will transform villages and towns across Sierra Leone. 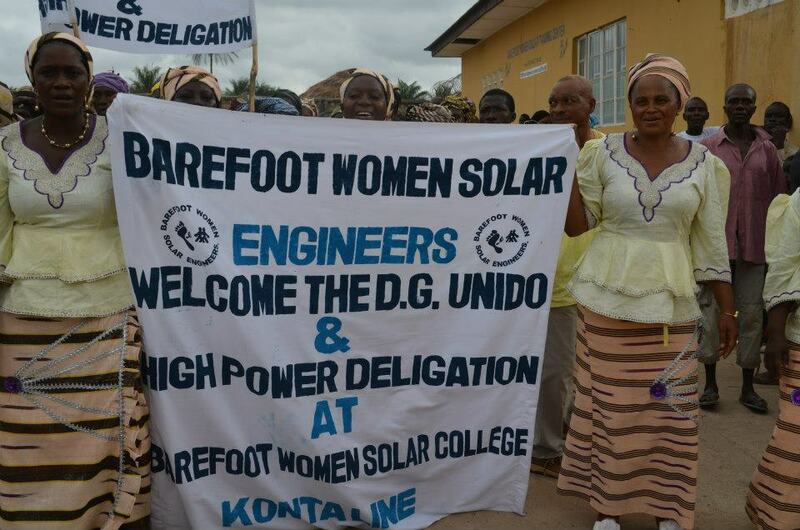 Mrs. Kanu is currently director of the Barefoot Women Solar College at Konta Line, Port Loko District, in northern Sierra Leone. She takes pride in being a mentor, encouraging old and young to get involved with renewable energies. Mrs. Koroma is a senior trainer at Barefoot Women. She coordinates the college's electronics workshop. 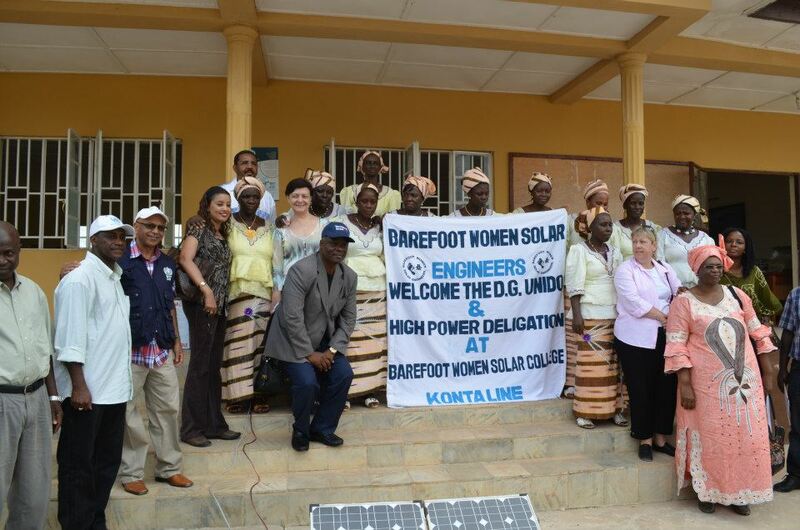 The Barefoot Women Solar College has electrified five hundred and fifty villages since it was established in 2010, according to Stephen Kargbo, who heads the United Nations Industrial Development Organization (UNIDO) operations office in Sierra Leone. “The college has installed and commissioned nine hundred and fifty (950) solar home lighting systems at police stations, churches, mosques, and health centers mostly in remote villages of Sierra Leone," he said. They have also repaired solar photovoltaic (PV) vaccine freezers in eleven (11) chiefdoms and implemented solar PV charging stations in all the villages electrified so far. To maintain sustainable pricing, a 7- member Solar Home System Lighting Management Committee is formed in each of the electrified villages, with the responsibility of collecting a monthly electricity fee of Le 7.000 (about $1.63) and ensuring the sustainability of systems installed in the villages. 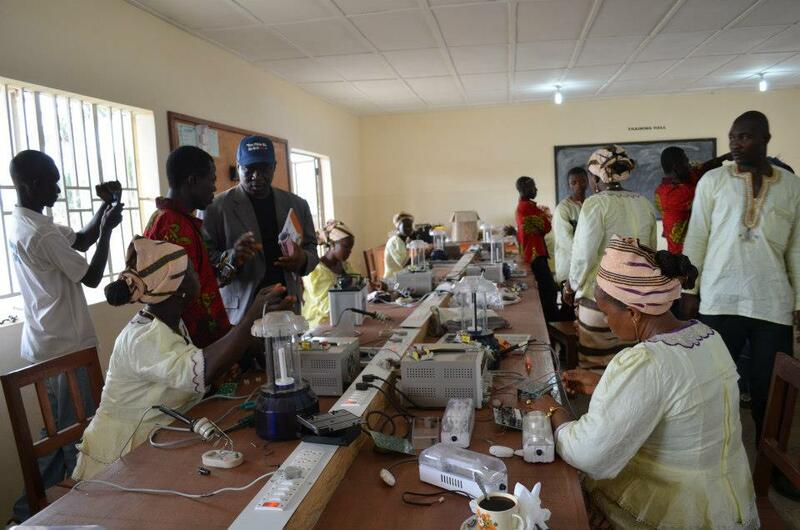 A village technician, accountable to the Solar Home System Lighting Management Committee, is selected and trained to operate and manage a solar PV repair shop in each of the project villages. The trained technician undertakes servicing of the solar systems, minor repairs and replacement of parts, and is a position reserved for a senior female villager in their sixties. “This training is essential for developing local technical support, which can also help make the project sustainable,“ Kargbo said. Training is also provided to the end users on handling and operation of the solar systems, as well as awareness campaigns for community groups on why solar lighting may be better than purchasing kerosene. Anthony Kamara is a UNIDO consultant based in Philadelphia. He was part of a delegation that was invited by the government of Sierra Leone and the UN Country Team, led by Kandeh Yumkella, director general of UNIDO, Michel Sidibé, executive director of UNAIDS; and Cherie Blair, founder of the Cherie Blair Foundation for Women. 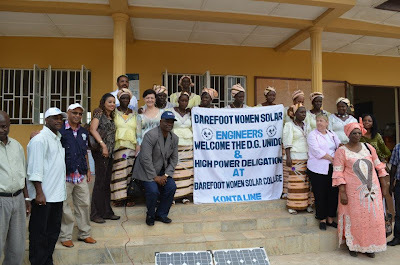 The UNIDO delegation marked International Women’s Day with development focused activities in Sierra Leone including a trip to the Barefoot Women College at Konta Line, Port Loko District. “During [the] visit, the women clad in their “ashobis” were eager to register their appreciation to the UNIDO director general for the great help he had given. The ladies demonstrated their skills for us by assembling and installing a solar light which they turned on.” Kamara said. Kamara also shared the story of how the women got a terse letter from the nation's powerful regulatory body for engineers and the practice of engineering in Sierra Leone asking them to stop using the name or title 'Engineers'. “They refused and sent back a letter saying they are not academics but technicians who use their skills for the community. It was funny how Nancy, their leader, explained it, “ Kamara said wryly. 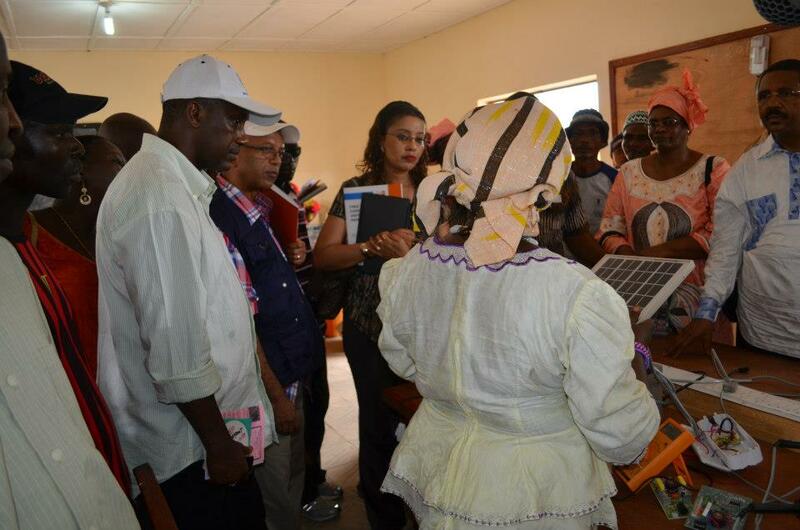 Kargbo, the UNIDO head in Sierra Leone, said the purpose of the visit was to assess needs of the college in terms of expansion and possible replication/scale-up of their solar PV activities all over the country. “ It was also to assesses tools/equipment [they need] to enable them undertake more advanced training and installation exercises, “ he said. Kargbo acknowledged difficulty in transporting installation materials and equipment to some project sites because of bad roads and terrains; lack of funds to replace the batteries after their four to five year lifetime, inadequate office equipment (Internet, computers, printers), lack of support for Barefoot Micro Enterprises, manpower capacity building, and few grants to purchase solar components and materials. Is there a brighter future ahead? More technicians will be needed for later maintenance as there are very few in rural areas that are familiar with photovoltaic systems, Kargbo said. “Sufficient awareness among the beneficiaries helps clearly identify the needs and improves implementation. Different types of awareness raising activities are also an important part of the project as the solar PV power plants are to be handled by the communities. “Campaigns such as demonstration of solar PV equipment, lessons on renewable energy and solar PV in schools will be undertaken. The application of solar PV systems for productive uses will be explored with the view to reducing poverty in Sierra Leone and more capacity building support for the institution. The assembly of solar PV cells into modules and production of gasified stoves will soon commence. Women are recruited by popular vote on a Solar Home System Lighting Management Committee. To make the short list, candidates must be personable, disciplined, illiterate or semi-literate, poor and a resident of the village.